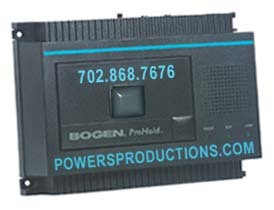 Bogen ProHold PRO16 Digital Player -- The superior audio quality of the ProHold provides the ultimate professional image. It has a specialized audio circuit that eliminates silent passages, automatic one-step downloading from tape to digital memory, and one-play trigger for special applications. The ProHold announcers achieve a full 64 KBPS digital toll quality sampling rate, for the most superior on-hold sound quality available.A specialized audio editing circuit creates seamless audio with no dead air. Since the digital circuitry has no moving parts, playback is extremely reliable. The built-in tape mechanism is only used while loading is in progress, and is not subject to the constant wear of traditional tapebased systems. The owner merely inserts a cassette into the housing. The ProHold automatically assesses the audio start and stop points, sets the record levels, downloads, and goes into play mode. For the user, this translates into no need for adjustments of any kind. For the on-hold professional, microprocessor control means fewer call-backs, smoother installations at the end-user site, and more satisfied customers. Changing messages is as easy as inserting a new tape.When the ProHold downloads the new tape program, it automatically erases the previous program. If power to the unit should ever be interrupted, the ProHold will automatically reload the program from the tape left in the unit. The ProHold family of products has uses beyond supplying music to hold buses. Included is a simple stereo mini jack, which provides a dual function trigger input that gives these units added flexibility.Trigger the one-time play with a momentary contact closure to have the ProHold play an entire message one time and stop.Additional contact closures that happen during the message play are ignored.This is a great feature for museums, promotional displays, and security announcements.  9-5/8" x 6-3/4" x 3-3/8"
Please allow for standard or express shipping.